Screening of baggage, metal detectors, explosive detection systems, and air cargo screening solutions requires a broad range of operational requirements and cooling solutions. Operation in extremely hot and cold climates, able to be portable via vehicle transport, able to survive the associated vibration and fast start up in the two temperature extremes. The technologies utilized in these mobile imaging systems range from X-ray and Gamma-ray imaging to advanced threat identification techniques such as neutron and diffraction analysis. Opti Temp makes high performance Chillers for these mobile imaging applications. An X-ray chiller is the component that removes heat from the X-ray head and these industrial chillers are the most important device used in managing temperature to insure high quality performance and long life of the mobile imaging system. 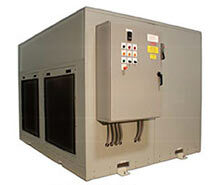 Chillers, both Portable Chillers and Mobile Mounted Chillers are completely self-contained cooling devices, able to serve the purpose of removing heat from X-ray heat-dissipating components. 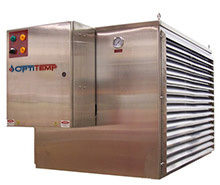 Over the years Opti Temp has proven to be a reliable supplier of Chiller equipment for a number of mobile imaging applications, working with several OEM’s that integrate our Chillers into their complete mobile imaging package. Opti Temp designs and manufactures standard cooling systems or, if needed, can design to customer requirements for size, portability, operating conditions, thermal load, and system footprint. Designed for the industrial environment with a long service life in mind these Chillers are recommended for all X-ray imaging processes.